A non-functional model of the Ragen Microelectronic Calculator. Distinctive features: One of the first calculators announced with LCD (liquid crystal display) and low cost. Appears to have never gone into production. Semiconductors - Two complementary metal oxide semicoductor (C/MOS) chips. 60 mm x 89 mm x 22 mm (2 3/8" x 3 1/2" x 7/8"). 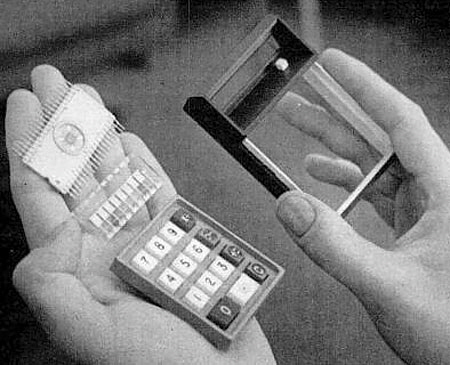 Announced late 1971/early 1972, by Ragen Precision Industries Inc, 9 Porete Ave., North Arlington, New Jersey, U.S.A.
A preliminary data sheet on the Ragen Microelectronic Calculator. The main parts of a prototype. The first under-$100 [under-£40 GBP] electronic calculator is on the way-and its all-U.S. made. Ragen Precision Industries of North Arlington, N.J., will ship in early January the shirt-pocket-sized device. Designed with two C/MOS logic chips and an eight-digit liquid crystal display, it's a four-function device with floating decimal point. Ragen builds both the electronics and display. Ragen has an order from Alexander's, a New York Department store chain, for 20,000 calculators with an option for 20,000 more. Measuring 2 3/8 inches by seven-eigths of an inch by 3 1/2 inches, it will operate for more than a year on a 9-volt dry cell battery. The chips drive the liquid crystal displays directly"
Now that the wraps are off the mini electronic calculator that Ragen Precision Industries says could retail for under $100, the question is: can Ragen produce them at the 4,000 to 5,000 per month called for by its initial order? The uncenainty results because the shirt-pocket-sized machine boasts two of the newest and least applied electronics technologies: complementary C/MOS semiconductors, used in a calculator for the first time, for the arithmetic, logic, and display drive circuitry, and liquid crystals for the readouts. "Without a doubt we'll be able to produce them," asserts Ragen's president. I.L. Lopata, adding "Our biggest concern technically is the molded plastic case." This confidence is shared by Albert H. Medwin, president of the Ragen subsidiary, Ragen Semiconductor Inc. of Whippany, N.J. Medwin directed development of the calculator. The semiconductor company has been making C/MOS chips for more than three years, he points out, and "they have been the largest and most complex" in the industry. "As long as a year ago, we were producing 3,000 to 4,000 chips a month for a data terminal customer." ... Its guts consist of two 220-mil [220 thousandths of an inch, i.e. 0.22" or 5.5mm] square C/MOS chips housed in individual 40-pin dual in-line ceramic packages and an eight-digit liquid crystal display with 7/32 by 5/32-inch digits. ... Ragen says the battery, because of the exceptionally low power drain of the C/MOS circuitry and liquid crystal displays, will last for 2,000 hours of operation. In contrast, competitive calculators often rely on rechargeable batteries, which will last as little as three hours. Another factor contributing to the unit's low power drain is that Ragen multiplexes the drive lines between the chip and the eight-digit liquid crystal display. Thus, instead of applying power to all digits, at once, it is applied sequentially, with the power to any one digit continually refreshed. To the human eye, the display itself, which relies on reflected light persists and appears continuously on. Power to the eight digits is less than 2 microamps, says Medwin. Another advantage of this technique is that the number of interconnections is reduced from 64 to eight between the C/MOS chips and the displays. And it also simplifies the chip circuitry because a single seven-segment decoder can be time-shared among the display digits. All of the electronics is contained in the C/MOS chips, which probably accounts for their relatively large size. Generally, the larger the chip the worse the yield. However, Medwin terms the yields "commendable." He points out that Ragen has been producing chips of this size for the last six months, with 300-mil-square chips scheduled to be produced sometime next year." "... Ragen Precision Industries, North Arlington, N.J. Their machine with its complementary MOS logic and liguid crystal display, has progressed to a model that turns on the display, but doesn't do any calculating. As of the end of February, Alexander's had not seen a working model. "If they send them, we'll sell them", says Alexander's vice president, Jerome P. Germain. For its part, Ragen promises to have calculators "on the shelves" by the first week in April. In the mean time, Germain, shopping around for another pocket calculator, has ordered 20,000 from a Toronto, Ont., company, Rapid Data Systems & Equipment Ltd. Its Rapidman 800, somewat larger than Ragen's machine, is expected to sell for under $100." After this the Ragen Microelectronic Calculator disappeared from the scene. Although non-functional models were displayed it is believed that no working examples were actually sold, and may never have been made. "Practical Electronics" magazine in March 1973 reported "Ragen announced an LCD pocket calculator that didn't make it to the market because of chip manufacturing problems". It is interesting to note that even Busicom, one of the most innovative calculator manufacturers, had problems in trying to get its HANDY LC LCD calculator to market around this time. "Under $100-calculator set for January", Electronics, October 11th 1971, p26. "Ragen confident it can build $100-calculator", Electronics, October 25th 1971, p32. "PS Buyer's Guide to Under $100 Calculators", Popular Science, March 1973, p86.